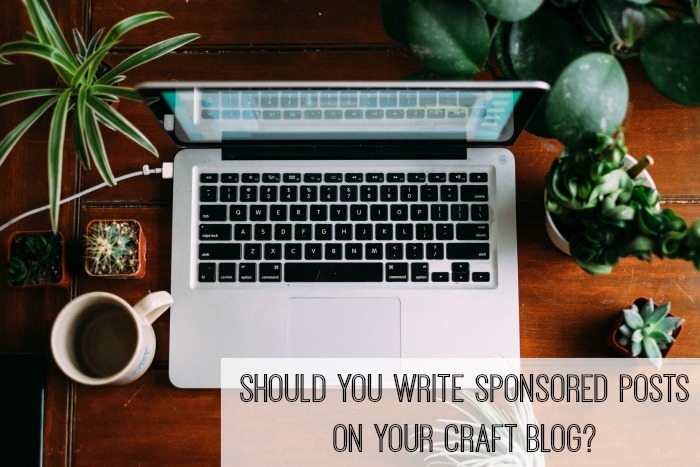 Should You Write Sponsored Posts on Your Craft Blog? Michaels is unveiling a new look at all of its Boston area stores and we are giving a select group of bloggers an exclusive sneak peek on Thursday, May 1 from 6-8 p.m. at the Saugus store. You will receive a private tour of the store, a personal crafting session with Michaels creative expert and a $300 Michaels gift card to use however you would like. We just ask that you share your experience and the new Michaels store design with your blog readers by Saturday, May 3. Please let us know by Friday, April 11 by 5 p.m. EST if you are able to participate. If you have any questions, don’t hesitate to email or call. We hope you will join us! There’s a lot of “yes” in there, mixed with doubt and questions about personal and business values. I think that as a community of craft bloggers we don’t really have a consensus approach when it comes to sponsored content. In an effort to parse out these ideas further I’m going to take you through my thought process as I figured out whether to accept this particular invitation. "Someone from a large, national craft company is contacting me out of the blue. They’re saying that the platform I’ve built is really good, and really big. They feel that I’m a leader." "This company is inviting me to go shopping for free. I can get whatever I want. I work really hard and I deserve a treat like this. They want me to be a VIP." Those were my honest feelings. I was flattered and a bit thrilled that they noticed me. Next I started to imagine a scenario in which I accepted this invitation. I head over to the Michaels in Saugus that Friday night to go shopping and attend my personal crafting session. What will I get? I’ve had my eye on some of those Martha Steward glitters. Paper punches are expensive so I could get a few of those. But do those things align with the mission of my business? And here’s where we drill down to the heart of the question: what is my mission? A mission cuts through feelings and ego. If you’re clear on your mission you can use it as a guide to help you navigate through decisions big and small. My mission is two-fold: I create sewing patterns and educational materials that help home sewists design and make stuffed animals and dolls. I create blog posts and educational materials that provide an insider’s perspective on a sewing business in order to help creative entrepreneurs thrive. I did a guest post on Sew Mama Sew a few months ago that was sponsored by a fabric company. I didn’t receive any cash to write that post, but I did get a $60 gift certificate in exchange for writing it. I accepted that offer for two reasons. First, the post is a stuffed animal sewing pattern, something vital to my mission. And second, I could spend the $60 on fleece. Fleece is my top choice in fabrics for the dolls and toys I sew and $60 worth is enough to buy 10 yards. I won’t have to buy fabric for the rest of 2014. How does this $300 gift card from Michaels in exchange for a blog post about their new store layout fit with my mission? My final thoughts circle around you, my readers. A blog is a public journal. Those of us who blog choose to make our journals public because we want people to read them. We want people to relate to our words, to admire or critique what we’re creating, and to share ideas with us. A blog is a way to build community. A good community is built on trust. When someone gives you something for free, no matter who you are, you have an underlying feeling of reciprocity. There’s a psychological obligation to repay them. This company wants to get its foot in the door of my community, ride on the trusting relationships I’ve built, and enter into a relationship of reciprocity with me. They’ve noticed that I work hard and they want my good word. And where does that leave you as a reader? Most likely fewer of you will click over to read that post than others that I write because I’ve clearly been influenced by a reward instead of writing on my own impetus. A shadow of doubt might linger about my future posts, too. If I've been influenced once, I could be influenced again. My trust with you might begin to erode, even a little bit. Instead of writing about the new store layout at Michaels and showing you $300 worth of new glitter and paper punches, I'm here writing about the underlying questions their offer raises for me and, hopefully, starting an honest exchange of ideas about sponsored blog posts with you. I think I got the better end of the deal. What if they had offered me $300 cash in exchange for attending the event and blogging about it? What if the event was at Joann's instead? What if they didn’t ask me to blog about it at all, but just gave me a gift card and an invitation to attend? Do any of these what-ifs change things? I feel basically the same as you do. I promote items on my blog all the time, even put them on the materials list, without compensation, just because they are great products. My customers and readers know this, and trust me. The few times I’ve taken “free” stuff, I would have used the product anyway and already had an idea, like my little puffy mini comforter tutorial – QD sent me the batting but then I went and bought a huge package (and all the fabric) anyway, so I could make more than one. Recently I was offered pre-release fabric to make into my new wallet pattern and post on my blog. Since I personally knew the person offering, I said yes. I struggled with how to write the blog post, but the fabric was lovely and one color and type of fabric I would never have chosen (a pink and orange cotton lawn – so not my comfort zone) turned out gorgeous! I wasn’t told what to do with the wallets once I blogged them, so I did a “comment to win” giveaway to get people to click over. Otherwise, I felt like my blog post didn’t really have a point. Overall I’m happy that I did it, but it will still be a rare thing to avoid the awkward. I think NOT asking me to blog/IG/tweet about it (simply inviting me) would be a yes. As long as I’m free to share (which I will, if it was great) or not (avoiding the awkward if it’s not) would be fine. That one would change my mind, but otherwise I’d turn it down too. What if you went, blogged about it and donated the $300 gift card to an art program at a local school? This is something I would do, to help out the school Art programs. Sure I could use the gift card for more Art products, but I already have a lot right now. Spelling out your thought process – you are always so honest – is great. I do that frequently too, for the exact same reasons. I’ve been approached on my blog also. I try to weed out the offers and only go with companies/people I believe in. I’ve been offered free fabric to make items and I tell the company “as long as I can review it 100% true, not just yay it’s great!”. I’ve found that most of them understand and accept. With the Michael’s case – If you shop there often and enjoy their store, you should have done it. But in the blog post clearly state your opinion and what they gave you. That’s just me… oh and do this stuff sparingly because when some bloggers (beauty bloggers are the WORSE) do it often, then you lose respect and can’t believe anything they say! I think you’re right on with thinking about this from a reader’s point of view. I know that my readers are interested in hearing about tools and supplies because I get emails ALL THE TIME asking me what I use. So that’s the criteria for me – if I use it in my own work I’m also going to list it in my patterns and write about it on my blog and sell it in my shop. That – to me – is a very natural and organic relationship – and I’m happy to receive free materials from the companies whose products I love and use all the time. That helps my bottom line. Sometimes I approach them to start this relationship and sometimes they approach me – but I’m always thinking about whether I’m answering questions my readers have. You are awesome. Your honesty and integrity are what keeps me a loyal follower. I am quite sure we would be best friends if you lived in Vancouver. Except I would be bugging you to come and sew with me all the time. Thanks for sharing your talent, your thoughts and your time. I really like your thought process. I think it definitely has to do with your mission/goal. I do think that sponsored posts and endorsements tend to make followers wonder about the bias behind the writing and thoughts, but again it has to deal with your mission. For those who are looking to make a living on blogging, I do see where they would lean more towards sponsorship and endorsements. The what ifs of the situation definitely do change it, and I feel that each situation should be handled on a case to case basis. Thank you for sharing your point of view and giving us some food for thought. Thank you for sharing your experience, Erin. Sometimes being invited to participate in something like this can be a good stretch. I’ve definitely been part of several blog tours for books in which I’ve had to make something that I would never normally make and have really enjoyed it. That would certainly be a good thing to do, Sue. When I get books to review that I can’t review for one reason or another (they’re quilting books or garment sewing books, for example, or I really don’t like them) I donate them to my public library. I think once you begin to grow a platform you are faced with these decisions ever more frequently. It’s helpful for us to think aloud. There’s always this balance between being beholden to someone and being free to speak independently. What works for me and my blog might not be the right thing for someone else, for sure, but at the very least talking about the motivation behind these decisions is helpful for everyone. Organic is a great word here. Does it flow organically from what you’re already doing? That’s a great question to ask. Ha! Today I’m reviewing a mini van and a Florida vacation! I really appreciate your thoughts on this, Abby. We’ve been at it for 9 years and I still struggle with these decisions often. One thing that I remind myself and often say to people who email me asking me to do a plug of some kind of another is, “we want our readers to take away something even if they don’t win the prize.” I think you made the right decision–it sounds like your readers would have nothing to gain by reading that post. Since you mentioned us and we’ve thought a lot about our (ever-evolving) mission, our policy on compensation, and the concept of reciprocity, I might do a reaction post to this, if that would be ok with you? I think it’s a complicated issue! I don’t mind sponsored posts, and like hearing about new fabric lines, tools, etc. I think this specific instance is awkward because unless I live in that area, I honestly don’t care about the new Michael’s opening. And actually, even if I did live in that area, I’m not sure I’d want to hear about a new store layout. I appreciate the thoughts you articulated on how you made your decision, and think they’re wise ones. But I hope the conversation continues to unfold and that no one’s take away from reading the post is that sponsored posts are negative, across the board. I think there are ways to have it naturally flow with the existing content in a way that does benefit readers. Though I have to admit, I do wonder just how much some of the campaigns pay when I see an obvious ‘stretch’ linking something unrelated to the blog’s normal mission/message. Wow, I admire you greatly for turning it down. Basically, it sounds like they were asking you to go shopping on their dime and write about the experience. So, you would be a big ad for Michaels more than you would be a craft blogger. So, by turning it down, you have affirmed that you are a craft blogger first. I admire that so much! I got very annoyed, a year ago, at a sewing blogger I followed who did a big ad for a detergent as a blog post. As a person who purposely does not wear clothing with any advertising or logos on it, I prefer to keep my advertising separate from the rest of my life. I don’t know how to explain it but I feel like bloggers who blog only to make some money for sharing a product are not sincere. Or, at least, I doubt their sincerity. Now, if you used Michael’s products and pointed out the ad on your blog and you got paid per click, that would feel very different to me. That is acceptable. Basically, I respect you greatly for the decision you made. Bravo. I think you have to follow your own values – I would also initially feel ‘yay, free stuff’ but the crux of the matter is that it ties you into a relationship you might not want. What if you agreed and then discover you hate the shop (I’m English so have no idea what Michaels is like!) but then feel obligated to write good things because they paid you off? Then it becomes a matter of your personal ethics and whether you would be happy to compromise them. Also, as a regular reader of your blog, I would not bother to read that particular post as it would have no relevance to me whatsoever. Perhaps entering into something like this would prove detrimental to the following you have built up. Raises a lot of food for thought! When I get approached, I always ask myself ‘does it fit in with everything else on my blog’ and ‘would my readers want to know about this product/book/etc?’ Sometimes giveaways are attached to the books I discuss on my blog and I see those as a treat for my readers. If something doesn’t sit right with you, even if you can’t exactly tell what ‘the problem’ is at first, then it’s probably better to say no. I do think readers want to know about new books and products though but we should be aware if and how we are ‘used’ in the marketing of a product. Thank you! I have come to really dislike sponsored blog posts. They seem so fake; it’s basically just an advertisement. I also get frustrated with bloggers who write about how much they like a pattern that was given to them. That’s great, but I’m more interested in what pattern they liked enough to spend their hard-earned money on, NOT what they got for free. It’s an interesting question. I truly dislike reading blogs where the author switches direction and becomes a solid advertisement from food to cars to, as someone above mentioned, washing products. I just think they’ve sold out, and don’t ever trust that their future posts won’t entirely be about what’s in it for them. There are a few food blogs I read, and I always skip their reviews of places like the Pillsbury factory, or wherever – part of that is that I’m in the UK so I can’t get those products, and the other part says that I don’t want people just writing about going on a jolly to play with food products which they will then try and foist upon us at every opportunity for the next x number of months (the posts which are also useless because, you know, we just don’t get dinner rolls in a can!). I would do the same with a Michaels’ or Joann’s ad, because, again, not a brand I have access to. So I think a good chunk is whether it fits in with your general ethos, but geography has to play a part too. Do you cater for people local to you only (in country terms), or do you acknowledge that you probably have people in darkest Peru or Timbuktu, who in this case won’t give a monkeys about a shop they’ll never visit. I frequently see US blogs saying ‘giveaway open to US only because of shipping costs’, but not with ones from other parts of the world. Trust me, postage is expensive everywhere! Now I have done pattern and book reviews before, reviews for friends I know online. I will be honest about what I think though, and thankfully I’ve never been asked to review a stinker! I also occasionally review products I’ve paid for and like, and may point people to a place to get them if they’re unusual, but I would pass on a similar voucher from Hobbycraft (our Michaels equivalent), because I know I wouldn’t find enough in there to like to want to sell the place, and really I don’t think my readers want to read about my craft shop jolly any more than I want to read about the food ones! I am running a big quarterly competition on my blog this year, and as part of that, I highlight a sponsor each week (no vouchers, codes or anything, and I only get to give a prize, there’s nothing in it for me). I was a bit concerned that suddenly doing an ad a week would put people off, but while I get few comments on those posts I seem to have retained, and even built upon, reader numbers since the start of the year, so I can breathe a sigh of relief! It has told me though that it’s not something I want to do much, if any, of once the year’s over and the competition has passed on to someone else. From a reader’s perspective I really appreciate that you turned this down I makes me value your site more (and I love it already) Integrity and honesty are very valuable qualities and certainly fostered blog reader loyalty like no other. I am not against sponsored posts or freebies as such, I like to see what is new and topical. But I want to trust the opinions expressed that the blog owner truly thinks this is a good or quality product. I entirely agree that that the item needs to fit in with the aims of the site. I do get a bit bored with the blog hop book tours which seem everywhere at the moment and seem quite repetitive. If this post had been a sponsored post about Michael’s I wouldn’t have read it. I would skipped over it in my RSS reader and would have never visited your site. I may have stopped reading your blog for a while too as the one type of blog post that I cannot stand is sponsored posts (well, that and sponsored giveaways) and so many blogs lately have started having more sponsored posts that actual content. Instead, I clicked over to your blog and read your full post and am even leaving a comment. I will likely remember that your blog is not likely to be full of sponsored posts and will make a point of reading your posts. I read blogs for useful information, tutorials, interesting articles, etc… Posts like this one. Sponsored posts, giveaways, sponsor announcements, etc… all offer me 0 value and make me wonder how much content is real vs. influenced by who a blog’s sponsors are and how much they are being paid. In short, I don’t trust blogs that post entries that are essentially advertisements which is what your Michael’s post would have been. If I wanted ads there are myriad corporate sites where I can see them. That is not what I am looking for on a blog. Abby, as always, honest and thought provoking. Your input here about the process of controlling your content and crafting you message carefully is much more valuable to me as a reader than hearing about Michael’s new floor plan, and obviously a lot of your other readers agree, too! I’ve been a loyal follower of yours for a long time and always feel that I learn something each time I stop by for visit. Thank you again for sharing your insights. That’s so nice, Joyce. Thanks for reading and for these words. I hope so! Thanks, Sarah. Blog hop books tours (or pattern tours or fabric line tours) are such an interesting phenomenon. Craft book authors don’t generally get sent on real book tours, but certainly need to work hard to promote their books. Seeing a book (or other product) mentioned several times in different places is an effective marketing tool. At the same time, it sure does get tiring. I’m not sure what the better alternative is, but I’m definitely open to discussing it further. That’s so nice. Thank you, Lisa. That’s an excellent point. I think a post describing something you bought and loved is a very powerful marketing piece indeed. That would be terrific, Kristin. I really respect what you do and the blog and audience you’ve built and I would value your response. Thank you. I agree with your decision. Simply because accepting means that you have to be seen to be loyal to a brand which you may not feel great about. For instance I understand that often book reviews are sponsored in as much as you are sent a book to review. If you like it, then you gush accordingly. If you don’t like it then you stay quiet. I don’t like that. I don’t think everyone runs according to those lines but many do. I would keep the warm glow that you feel from being ‘chosen’, but I would let them keep their money. I’m not for sale and it seems you are not either. I’m glad to know that. Sometimes what you lose on the swings you more than make up for on the roundabouts. Integrity counts a lot in my book. Craft book reviews are so tricky that way, Sara! You raise a really good point. I try my best to really use a book before I review and it give a comprehensive review. That being said, I just turned down reviewing a book because it had no step-by-step photos or diagrams and all of the patterns had to be enlarged by 130%. Instead of giving a critical review, I chose not to review it. It’s so hard to know if that’s the right decision. If you didn’t think it was appropriate for a review like this to appear on your blog, then you did the right thing. I think they were rather bold to ask for a review (and by a certain date yet). If they had offered you the GC without obligation, then I would have said go for it. I just discovered your blog from a google search (for prairie points, lol!) and what a treasure trove of information. Your post on writing a craft book review convinced me to subscribe, and this post immediately showed up in my reader. You bring up some really excellent points. Both posts are very helpful to me as I’m making similar decisions about affiliate links and sponsored posts (and trying to figure out whether to write a review of a book I recieved, but really had some difficulty with when making a project from it!). Thank you! You’re so welcome, Emily! I’m glad you’re here. I’m just now starting to get into sponsored posts and have already decided that I’ll write a sponsored post only if the products I’m using are ones I already use (for instance, I’m working with a ribbon sponsor, and I make things with ribbon…..and a knit fabric sponsor, because….yep. I design with knit fabrics). The main question: Will the readers find value in this post? If not, then it’s not worth doing. I wouldn’t have done the Michael’s post, either. Same reason…possibly JoAnn’s, but I don’t know – writing about a new store layout isn’t my thing. I’d certainly take it if they wanted me to write a skirt pattern for them, though. That’s what my readers *want* to see…and so that would be fine. Lots of gray areas with sponsored posts. I’m not opposed to sponsored posts – but they’d have to be posts that I’d like to read myself. I follow sponsored people and they are very upfront about that. The ones I like aren’t ever “selling” the sponsored stuff as much as they are sharing tutorials using the sponsored fabrics or giving away fabric bundles to their readers. I see that as okay, especially since it’s all upfront. I wouldn’t have been bothered if you had taken the offer, but I’m proud of you that you didn’t. Hope that makes sense. From the other side, as someone who works in web development – the reason they asked you is because you have a large established blog audience on a domain with good SEO. They wanted you to write about it so their new stores had an SEO boost in search engines, that’s it. Basically, anyone who writes the posts for them is doing their “viral marketing” for them. And that’s all well and good if someone wanted to say yes – as long as they know *why*. The reasons anyone or any company asks any blogger to write about their stuff out of the blue is for SEO. Thank you so much for this post. As a reader, I’m very suspicious of bloggers who frequently review products. I know it’s flattering to be offered free things and gift cards for “one little post” but it erodes the trust between blogger and reader. I think it’s a good idea to have a mission statement that you keep nearby so that when we’re tempted to take freebies, we can quickly see if it’s alignment with what we’re doing. Oh, and I really hate when the exchange is hidden in the post. Just put a disclaimer at the top of the post so I can decide if I even want to read it, otherwise I feel like I was duped. Most of the time I don’t read reviews because they’re pretty much advertisements. Even though bloggers always emphasize that the freebie doesn’t influence their reviews, I’ve yet to see a negative review of any paid product and that makes me even more suspicious of those relationships. Bottom line, it’s marketing and anyone who pretends otherwise is being dishonest. I’m glad that bloggers are able to get these opportunities and if everyone was just upfront about it, I don’t think anyone would really have a problem with it. That said, I think you made the right choice. Thanks for sharing your thought process about this topic. I just discovered your blog a couple of weeks ago and I’ve already learned so much. Thank you! Hi Abby, I was really interested in your thoughts and especially the comments on this post. As a blogger who’s main income is from sponsored posts it’s always a challenge as to which posts I will accept or not. In Australia craft blogging is extremely niche so it’s vary rare for me to be offered the opportunity of paid posts by a craft related company. All of my sponsored posts in the past have been more ‘lifestyle’ focused. Because of this I have to work a lot harder to make my sponsored posts as relevant as possible to my readers. Sometimes they are well received, other times they don’t get much traction, but the reality is that they pay the bills and without them there would be no blog. To a certain extent I think my readers understand that sponsored content is something they need to accept in exchange for getting so much high quality content for free. I don’t feel like I am selling out, but facilitating a way for my readers to have lots of good content without them paying for it. I wonder how many readers who say that they don’t like sponsored content would pay to read a blog if it was behind a pay wall? I don’t tend to blog for gift cards, or fabric (I really don’t need any more stuff), usually I get real dollars which pays my mortgage and school fees. It’s a really important conversation to have, and as a blogger I often feel like I’m being pulled in every direction and trying to keep the right balance is always a challenge. I agree Abby. If there had been something at Michael’s that would have been truly useful to your business it might have been different. I recently went to a Michael’s since I hadn’t been to one in years and there wasn’t anything in their store that I couldn’t get from a supplier myself nor was there anything that I really needed or wanted. There are only a handful of suppliers I use and recommend for my business. I try to use them as affiliate programs when possible. One company recently got on board the affiliate train and I am really excited because they have the best customer service I have ever encountered, plus I purchase supplies from them all the time. I think it is important to choose your sponsors wisely because you have to maintain the reputation that you have worked so hard to build. Honesty is always the best policy. P.S. I don’t make and sell plush toys but I do enjoy your business posts. I originally found you because I was looking for information on how to make .pdf patterns for when I get around to creating an original pattern. I so appreciate this comment, Cinti. Writing a good blog is SO MUCH WORK. If that is your only (or main) source of revenue, you have to accept that advertising is going to be a big part of what you do. Whether it’s managing multiple ad programs, running an independent ad program yourself, or accepting sponsorship, that is how you will earn money. We accept ads in magazines and newspapers and on the sidebars in blogs, but now that companies are seeking ads that are embedded in content, or content that is in itself an ad, it becomes even trickier to decide what to do. Thank you for sharing your experience, Cinti. I would TOTALLY have done it!! But… I really use some of their store brand yarns. The Bulky weight yarn is actually pretty nice. I do use it in a lot of the products I knit and write about on my blog. I use nicer quality fiber too, but I absolutely love the Loops and Threads brand yarns that I use. $300 of their yarn would be manna from heaven for me. I have actually written about their product line on the blog, so it fits my mission statement. I prefer to support fellow small businesss, but not every one can afford to purchase an Indie fiber product. However, most people have access to and familiarity with a Michaels store. Great article!! The comments you got are just as interesting to read. I’m only starting on my journey with the blogs. I’ll be two in August! So, I have a long way to go and a LOT to learn. I appreciate you providing this amazing resource. Thank you for this post Abby. As a new blogger I really appreciate your perspective. I have yet to be approached by sponsors, but what would probably had been a spur of the moment decision to accept, will now be met with more discerning thought should I ever be given such an opportunity. You have inspired me to write a mission statement and I am certain that I will be a better blogger for having read this. HI Abby, I’m a polymer clay artist who just recently started reading your blog. You sew, I make jewelry, but have sewed in the past and have considered doing some small sewing projects again. Your decision not to do a sponsored ad for Michaels fits with the direction you want to take your blog and I respect that. I have found though that cross-pollination of arts and crafts is a good thing. I shop Michaels all the time and find all kinds of materials to use in my work even if it is not directly related to the jewelry aisle. For example, I use scrapbooking elements in my mixed media work, use sewing hooks and eyes for clasps, use sewing buttons, yarn, ribbon and embroidery materials all for jewelry making. Quilters use paint and paint mediums in their quilts, also found at Michaels. I would have found lots of directly related sewing materials at my local Michaels that I think you’re readers may have enjoyed (although maybe that is a returned sewist talking, maybe the materials are too basic). I would have appreciated seeing a blog post about how to use non-conventional materials that may be more accessible in making stuffed toys or other sewing projects. My thoughts anyway. Thanks for a thought provoking blog post. Oh totally, Maria. I think a blog post about using unconventional materials found at big box craft stores would be terrific. I’m totally in favor of experimenting and incorporating new and different materials, and nothing is too basic for me. I would just prefer to buy or find those materials on my own instead of having my blog voice be an advertisement for a huge, national chain store. 3 I review free stuff I may not use myself but it pertains to my craft and blog and that some of my readers might find helpful and to help out a fellow blogger who is starting out e.g. a sewing pattern company that someone I know has just launched and which may or may not be fabulous (because it’s still brand new) . I’d give an honest , if limited, review and send people in that direction to check it out themselves. 5 Reviews aside, I do not write posts in exchange for money/cash/gift cards. I also do not accept guest posts in exchange for money. I just send those email messages directly to the trash. Because I have accepted some review invitations, I’ve had the opportunity to try products that I never would have thought to buy myself, and I have loved them and subsequently bought more of them, even for gifts for others. My principle is (an attempt at) transparency to my readers, and I try to keep that in mind whenever I say Yes, No or hit Delete. I agree with you that thinking it through in advance is really helpful in feeling prepared when different asks comes in. By deciding that I don’t accept anything for free in exchange for a review (including books) I know exactly how to respond and, over time, I find I get less and less of those requests. I agree with your decision………..for one simple reason……..key words “your decision”………keep it that way. I have no problem with sponsored posts since I blog for Mood Fabrics. From time to time I am asked to review merchandise, especially books. I’ve turned this into a win-win situation by doing the sponsored post and then hosting a giveaway with the merchandise. Just imagine a $300 giveaway to Michaels!! If it had been Joann’s where you could get your fleece, then I’d say yes, that would change my acceptance. Interesting though, Lorian. You might be right. It’s Kerry again. I just want to thank you so much for your honesty and interety to your readers, work and the purpose of your business mission. You are an example to a new blogger in the sewing/quilting/crafting entrepreneur market. That’s so lovely of you to say, Kerry. Thank you.